Aims. In an attempt to reduce the risk of work related musculoskeletal disorders (WRMD) in computer users, while maintaining comfort and functionality, different chair designs have been developed. 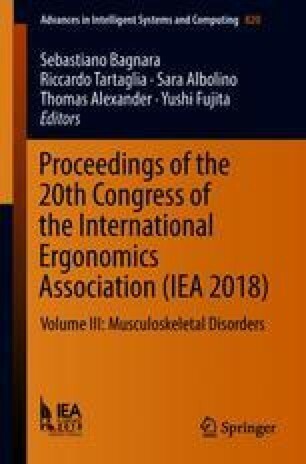 This study aimed to determine the effect of chair inclination, arm support and touch-typing on muscle activation in the upper body. Methods. A randomized balanced design was used to test twenty subjects performing a three-minute computer task, consisting of both typing and mouse activities, with three chair seat conditions (inclination of −14°, 0° or dynamic) and three types of arm support (none, chair, table). The angle between the seat pan and the back support was fixed, where the angle of the back support relative to the seat pan was consistent at a 93 angle. The nine resulting conditions were tested using a randomized balanced design with a 5-min familiarization period prior to the experiment and a 10-min break half-way through the measurements. Unilateral surface electromyography (EMG) was recorded from nine upper neck and shoulder muscles at the right side. Exposure variation analysis (EVA) using normalized EMG was performed to analyse load and characteristics of muscle activity in both the amplitude and time domain. Prior to the experiment, maximal voluntary contractions (MVC) and standard isometric contractions (SIC) were recorded. A mixed design repeated measures analysis of variance (ANOVA) was performed with chair inclination (−14, 0, dynamic) and arm support (with, without, table) as within subject variables and typing skill (touch-typing vs. non-touch-typing) as between subject variable. Results. A chair inclination of −14° resulted in lower muscle activity with higher variation in muscle activity for the trapezius ascendens and transversus muscles, whereas higher muscle activity with higher variation in activity was found for the other shoulder muscles. Significant main effects of arm support on muscle activity were found for several muscles. Muscle activity significantly was lower in the table support condition compared to the without support condition. For several muscles, the table support condition resulted in a significantly lower muscle activity compared to the chair support condition. No differences in muscle activity were found between touch-typists and non-touch typists. %MVC, APDF were similar for all chair inclination and support conditions for all muscles. Touch-typists were more productive. Conclusions. It is concluded that: (1) A backward chair inclination of −14°, as recommended in the literature, decreases the muscle activity of the muscles depressing and retracting the shoulder, whereas activity of the muscles elevating the arm and shoulder increases. The variation in overall shoulder muscle activity increases with a backward chair inclination; (2) The use of arm support or the use of the table as an arm support resulted in lower and more dynamic muscle activity; (3) No differences in muscle activity were found between touch-typists and non-touch-typists, but touch-typists were more productive.